With vibrant illustrations and a gentle, simple rhyming scheme, I Love Saskatchewan takes children on a whirlwind tour of the Province, building pride in place and encouraging discovery. From outdoor adventures on Lac La Rouge, enjoying a skate on a local pond during the winter, visiting Scotty the T.Rex in Eastend or the Mounties in Regina, this is the book that absolutely every Saskatchewan household with children must have. 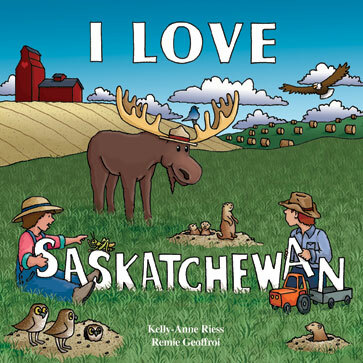 From the Crooked Trees of Alticane, Mac the Moose in Moose Jaw, the Saskatoon Pelicans and the famous Hoop Dancers, I Love Saskatchewan makes the province come alive.